Delta Medical Clinic (Burleson) - Book Appointment Online! 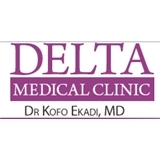 Delta Medical Clinic is a full service Internal Medicine/Primary Care practice devoted to providing the highest level of care available anywhere. To that end, we utilize state of the art medical and computer equipment in every aspect of the practice. This includes the treatment of chronic diseases such as hypertension and diabetes as well as the provision of well physicals and other aspects of preventive care. Patients’ charts are stored securely in an electronic format, making patients personal medical information more readily accessible and less likely to be misplaced. Blood draws are done right here in the clinic for greater convenience of our patients. Initial office visit is used by staff to gather pertinent information (i.e., labs, blood draws, image studies). This is to ensure that vital diagnostic information is available to physician when meets patient.